It has long been assumed that President Vladimir Putin, whose term of office expires next March, would prefer to remain in power. But how he might try to do so while operating within the terms of Russia's constitution has been a source of endless speculation. On Monday, Putin provided what may be the answer, when he announced that he would head the list of the ruling United Russia (UR) party in December's election to the Duma, the lower house of Russia's parliament. While it may sound like a step down for an executive President to run for a seat in a legislature that has largely served as a rubber stamp to his policies, the move suggests that Putin may opt to reorganize the Russian power structure  if he can't hold on to the seat of power, he could always shift power to a seat he can hold. The practice of putting a "power engine" at the top of a party's electoral list is well established in Russian democracy. Usually a cabinet minister or regional boss, this figure heads the list as a vote-getter, but then steps aside to allow others to take his seat and leadership role. Putin, however, may have something bigger in mind than simply helping the electoral prospects of the party of his creation, which was bound to win the Duma election anyway. Indeed, he made his intentions clear in pledging, to a standing ovation, that should the party carry the election and a worthy successor replace him as President, he could agree to become Prime Minister in 2008. The UR list is not expected to enjoy anything less than a landslide victory. And the identity of his worthy successor as President may matter less than his willingness to comply with Putin. Prime Minister Putin, that is. Monday's announcement was accompanied by an unprecedented, blistering attack on the legacy of the man who anointed him President, Boris Yeltsin. For the first time today in his eight-year tenure, Putin lashed out at what he described as the anarchic, chaotic and painful 1990s  a period that threatened Russia's integrity, he fumed  reminding the mesmerized hall of how he saved his country from the shambles of his predecessor's rule, although he avoided identifying Yeltsin by name. Putin made clear his belief that the Russian people want their savior to stay, and that he will heed the voice of the people, without violating the constitution. So, after the December 2 vote, expect to see the incumbent President Putin enter the Duma as leader of the victorious party, and as such claim the role of Speaker. As Speaker, he can suggest that the incumbent President (himself) nominate the leader of the majority party (himself) as premier. As a Duma deputy, he can even vote on the issue. At the same time, Putin would likely step down from the presidency in December, triggering the constitutional requirement that the current Prime Minister serve as acting president until the March election. (The same thing Yeltsin did in order to give Putin a leg up to the presidency.) That may help explain why he recently named Viktor Zubkov as Prime Minister  a figure entirely dependent on Putin, with no political base of his own. That scenario would help Putin run the country from the office of the premier. 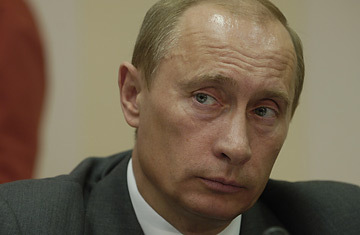 And in Putin's mind, the next President may only be keeping his seat warm. After all, while Russia's constitution demands that he step down in March having served two consecutive terms, it does not preclude him from running for President again four years later.